How do you introduce children to the world of electronic music? This was the question posed to artist Louis Warynski aka Chapelier Fou. His answer, an installation called the Végétophone, takes inspiration from nature and presents synthesizers and effects as parts of a tree, understanding connecting sounds as virtual branches, and patterns as fruits. Watch a short video about the Végétophone below, then read on to learn more from Warynski about the making of this special piece of art/instrument, and how Live and Max for Live were involved. How did you conceive of the Végétophone? Coming from a music teaching background, when I was asked to settle down in a primary school for an artist residency, my first wish was to make something that would really benefit the children, and not just myself as an artist. 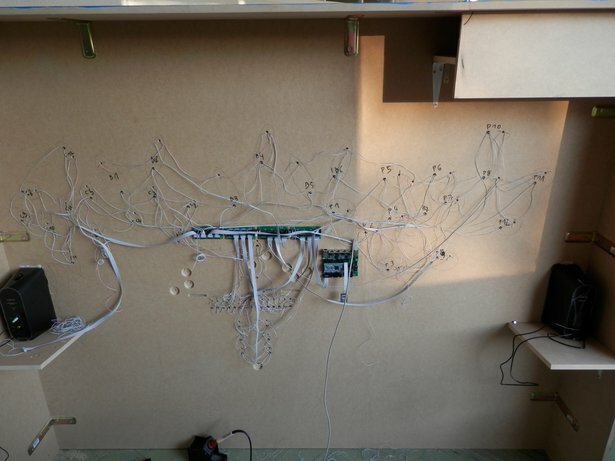 Slowly came the idea of an installation at the crossroads of electronic music and teaching. I conceived of some sort of machine that would be an art installation as well as a tool for learning some basic principles of music - such as scales, minor and major modes, time signatures, etc. I am quite convinced that such principles are more easily understandable by manipulating them hands-on, rather than just studying their concepts. I decided for several reasons to picture the music as a tree, with three main branches: a rhythm section, a chords section, and a melodies section. 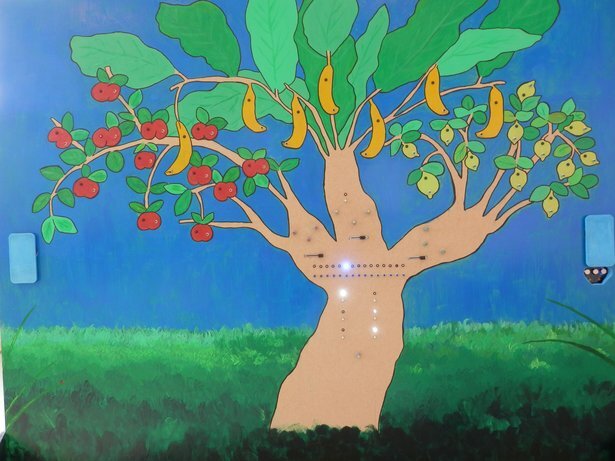 Each branch would have its own sort of “fruits” (limes, bananas and apples), and each fruit would be a musical pattern. The trunk is where you would find global parameters (tempo, time signature, root key, major/minor modes) that have an effect on each musical branch. The finished Végétophone, with controls on the trunk, branches, and fruits. Do you see Végétophone as a teaching tool? It has been during the whole duration of the residency. The main goal was to teach the children some musical concepts and vocabulary, so they can link them to something they feel and play with. We spent quite some time together, listening to music, analyzing it, dancing to it, etc. 90% of the sound material is samples that I’ve recorded with the children, in different rooms of the school - with themes such as books, sports sounds, kitchen noises, sisters’ toys, dad’s musical instruments, and more. The idea was also that the children (nine years old) from the class I’ve been mostly working with would transmit their knowledge to the other classes, and their teachers. How does the Végétophone work? How does each button/slider/knob affect the sound? On the trunk, you can set up the parameters that will affect the whole network. For the time signature, instead of the traditional fractional numbers (that I’ve always found disturbing), you choose whether you want a three or four beats per bar, and decide if those beats are divided into two or three parts. Practically, this gives you 3/4, 4/4, 9/8 and 12/8 time signatures. The tempo is set with a simple knob. The global transposition goes from -7 to +7 semitones (IV and V degrees on both sides of the root key). Each fruit contains a musical pattern that you can trigger and stop with a button. Only one fruit of its kind can be playing at the same time - this is indicated by its LED. At the same time you can have a drum track, a bass and chord track and a melodic track playing, and be sure that they will fit together in terms of pitch, tempo and time signature. Each branch has its own settings: volume from pianissimo to fortissimo, delay and reverb sends (mountain echo and cavern space), and sound/kit selection, accessible with pots and faders. The bananas have an extra option: arpeggios on the chords. Basically it’s nothing more that a gigantic midi controller! How is Live involved with the Végétophone? Everything is done in Live 9 and Max for Live running on a Mac Mini and controlled in MIDI with the help of a MIDIbox 128i/o and an Arduino board. - Sound selection is made by moving a chain selector in Racks. - Major and minor selection applies a scale midi effect on ‘bananas’ and ‘apples’. - Global transpose applies a pitch midi effect on ‘bananas’ and ‘apples’. - Tempo is controlling… well, the tempo. - Effects are just two return busses. - Arpeggios are made with the Arpeggiator midi effect. All the sounds are made with samples played by Racks of Simplers and Drum Racks. A few instances of Operator are used as well. The hardware guts of the Végétophone. Were there different considerations in designing an installation for children? Honestly i think that, except for the size and some funny sounds, this could be fun for grownups. I had a lot of fun myself playing with it. Maybe a more schematic, abstract version, more focused on explaining the relationships between elements, would be better for adults. When you think of it, the tree shape has its limitations, since it doesn’t show the sequences. And it might make you think that drums are affected by tonal setting, which is untrue. This are considerations that I have in mind for a possible carry-away version.